Washington Apple Pi's 2009 Photo Contest brought out the creativity, ingenuity, technique, sense of artistry, and sheer luck of Pi members as they set out to capture frozen moments of time on film. Er, flash RAM. The Photo Contest III promises to do the same. Another week to get your photos and captions ready. Contest is only for Washington Apple Pi members who have active accounts through August 31, 2010. A contestant must be the same person as the photographer and the submitter. There are two, self-determined, classes of contestants: Novice and Advanced. 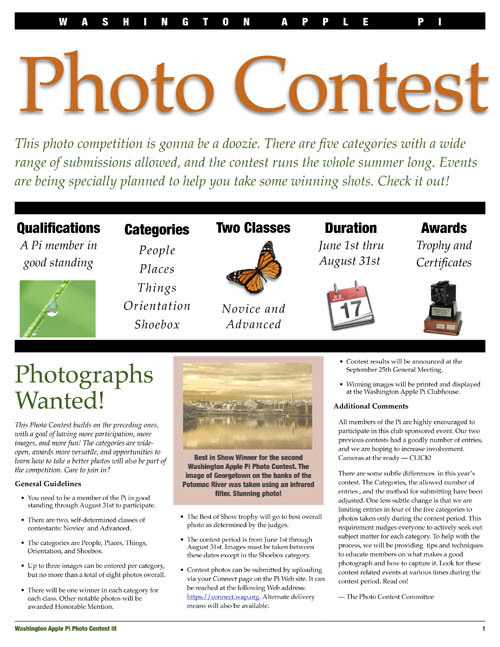 Photos must have been taken within the contest period (June 1 through August 31), except in the Shoebox category which will have no date restriction. 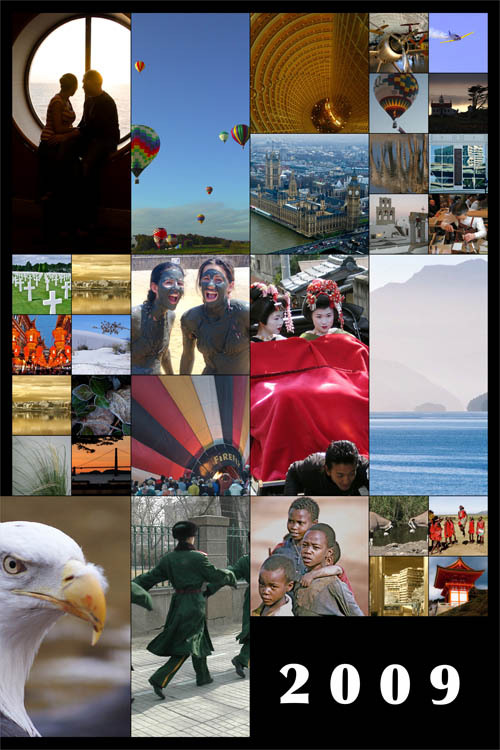 Any submissions in any category cannot have been entered into any other photo contest. A limit of eight (8) photos can be entered in the contest with a limit of three (3) per category. An image may be entered in only one category. Basic entrant info will be collected when uploading images. A caption should be included for each photo submitted. If entries are submitted other than through the Connect Web page, include name, class, image category and caption. Only JPEG and TIFF format files will be accepted, with higher resolution photos highly encouraged. Entry images will be collected via three means: uploading to the contest Web site, CD or flash drive. Preferred choice will be by uploading to the contest Web site. Submissions may also be delivered in digital format on a CD or flash drive. Email submissions will not be accepted. One winner per category in each classification. Other notable images will be awarded an Honorable Mention. One Category Winner will be chosen from each category for each classification of contestant. Any number of Honorable Mentions can be awarded in each category for other notable photos. A Best of Show winner will be chosen from all submissions and they will be awarded the Best of Show trophy. Certificates will be given to Advanced and Novice winners and to Honorable Mentions awardees. Contest entry is by default full permission to place the image on the Washington Apple Pi Web site and to reproduce in other medium, such as in the Journal or as a displayed printed image, as the Pi sees fit. The contest brochure, a three page PDF document (10.7 megabytes) has complete details.